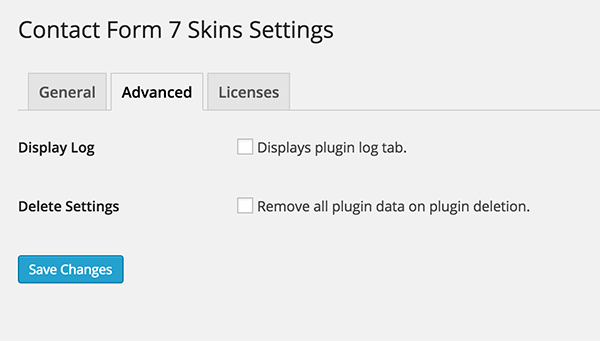 You can change Contact Form 7 Skins settings by clicking on Contact → CF7 Skins. This page is divided into three tabs or sections. 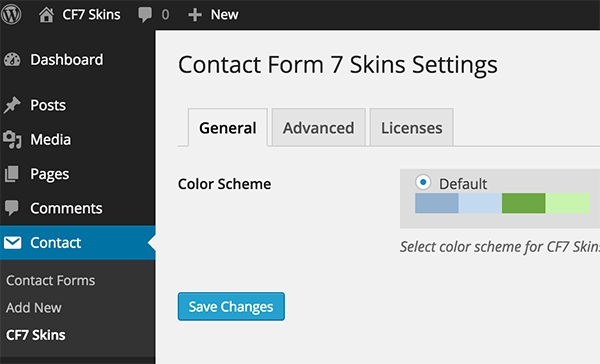 On the general settings tab you can choose a color scheme for Contact Form 7 Skins user interface. Currently, there are three color schemes to choose from. Simply choose the color scheme you want to use and click on the ‘Save Changes’ button to store your settings. The Advanced tab allows you to configure some advance settings for Contact Form 7 Skins. These settings are useful for troubleshooting and clean up. Most users will probably never need to change these options. The first option on the advanced tab allows you to display plugin’s log file in a separate tab on the settings screen. Selecting it and then clicking on the save changes button will display a logs tab where you can view plugin’s log file to troubleshoot errors. The second option on the screen allows you to delete all plugin data when you delete the plugin. Warning: Deleting plugin’s data upon deletion is irreversible and you cannot undo it. 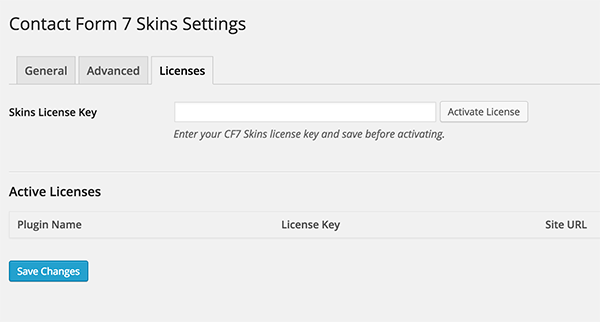 The Licenses tab is where you will enter your license keys. Adding a license key and activating it is fairly straight forward. First you will log in to cf7skins.com Account. There you will see a link to your downloads and licenses. Simply copy your license key and paste it on the Licenses page. First you need to save your license key by clicking on the save changes button and then click on the Activate License button.